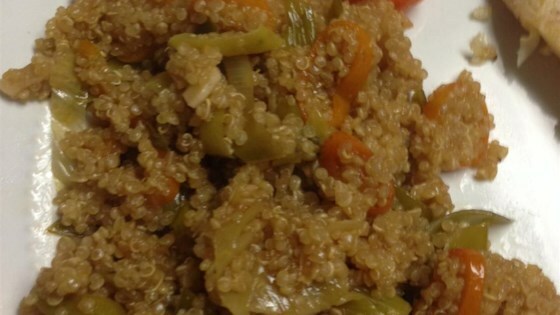 "This quinoa dish goes extremely well with fish. I bake the fish with kumquats as well. Try it with multi-colored quinoa." Heat olive oil in a skillet over medium heat; cook and stir leek, garlic, and kumquats until brown, 5 to 10 minutes. Season with salt. Cook and stir quinoa into kumquat mixture until quinoa is toasted, about 1 minute; add chicken stock and bring to a boil. Reduce heat to low, cover, and simmer until quinoa has absorbed the chicken stock, about 20 minutes. See how to make quinoa stuffing with squash and dried fruits.